No doubt, WhatsApp is number one messaging app from day one when it was launched first time. As like in case of other social media sites, anyone can message you on WhatsApp, no matter whether they are connected with you or not. The only thing they need is your mobile phone number. Sometimes, we want to block any contact on WhatsApp. For example, you may want to block your friend, classmate, nasty cousin, family member or office colleagues. On the other hand, If an unknown person is messaging you continuously then, you can get rid of it by blocking its contact number. I usually block my relatives and cousins for some personal reasons. 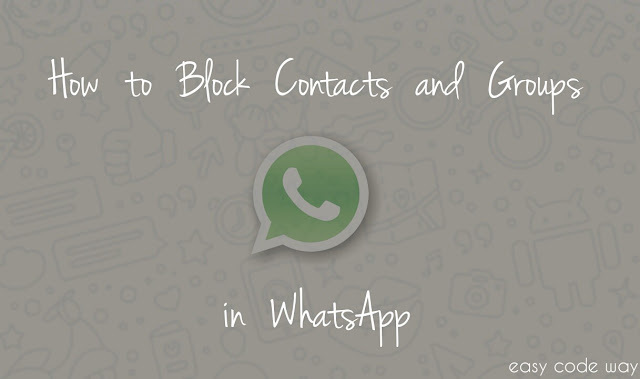 In today's tutorial, we will discuss on how to block and unblock contacts on WhatsApp. Moreover, this tutorial will explain what will happen after blocking. Later on, we will also discuss on how to block WhatsApp groups. Though there is no direct option to do this but you can opt other indirect way. 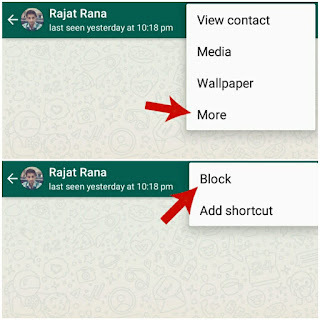 There are two different methods to block any contact on WhatsApp. Actually both of them are same but the approach is little different. Let's start with first one. In this method, you've to change privacy settings. Follow these step by step instructions to block any contact. Now move to "Settings > Account > Privacy"
Under messaging section, click on "Blocked contacts" option. Finally select the contact name that you wish to block and you've done it. Note: Before using any of the method, please turn on your mobile data or Wi-Fi. If there would be no Internet connection, it will display an error message as "You need to have network access to block/unblock a user"
To unblock the same person, go back to the "Blocked contacts" list then, click the person name and select Unblock option. Now open person chat. You can also open it from "Contacts" tab by scrolling left. Now click "More" and then select "Block" option. A pop up box will appear. Click OK to allow permission and that's it. 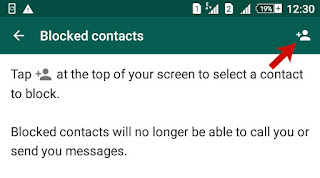 As like in 1st method, you can unblock contacts with same process. Many of you might be thinking that how this will affect blocked users. Here is what happens when you'll block someone. Blocked user can't see your profile picture, status, last seen time and online information. He/She can still send you messages but they will not be delivered. In other words, they will only see single tick mark on message which means that it was sent but wasn't delivered or read by the person. You will never receive them and thus sender will never see double and blue tick mark. You can't call or message the person you've blocked. Before this, you've to unblock them first. Blocked person can't add you in new groups but he/she can still interact with you in common groups. 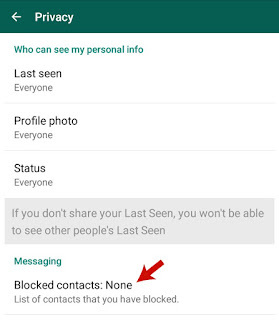 Note: After unblocking any contact, you'll not receive any call or messages they had sent you when they were blocked. How to block WhatsApp groups? The another amazing thing about WhatsApp is that, you can do group discussions with your friends, family members and colleagues. 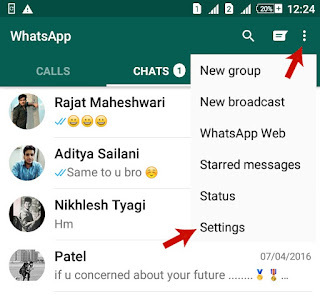 Anyone can create and add you in WhatsApp group without your permission. Sometimes, we want to leave a group for some personal reasons. Though you can easily exit them but chances are, admin may add you again. Then how to remove it permanently? Speaking frankly, there is no direct way to block WhatsApp groups. You can only exit, mute and archive them. However, I had found a way by which can prevent the admin to add you back in groups. It's very simple. First of all, block the person (or admin) who is adding you in group again and again even after exiting. For this task, you can choose any of method mentioned above. Before this, make sure to add admin mobile number in your contact list. After blocking admin, exit the group. To do this, open group info and scroll down to bottom. You'll find a red color "Exit group" button. Simply click it and then hit "Exit" button to allow permission. Now admin won't be able to add you again. If there are more than one admin, you can block all of them one by one. So that's all for today guys. If you've any questions, please ask me know in comment box. Which method you've used? Stay connected for more interesting tutorials. Very informative article. I really wish I could block a whatsapp group temporarily, to join later BUT at my own discretion. Also, I don't want to announce to group members that i am not interested in their posts one bit. Hence exiting a group is not the option I want. Even after having muted a group, the new messages keep putting this group right at the top of the chat lists. same situation here, wish I could block the group (not recieving any posts from them) without announcing the exit form the group. WhatsApp is run by a group of morons who don't understand what users want. I too am fed up with groups that can't be blocked. Can't exit them either or people will think I am arrogant. What Fuzail wants is exactly what I want too. I wish WhatsApp would introduce an option to do that. If I am the admin then it is possible that no post will go on the member which I don't want but without removing from the group. Hi if i make my profile picture privacy to - My contacts only . And if i am added into a group , so all cannot see my profile pics Right? I'm so annoyed by whatsapp group people keep adding me without asking . I hope whatsapp comes up with a way to block groups. there are some unknown people joining our whats app group. we dont understand how they are getting the link. How can we stop them from joining the group. they are using different numbers to join the group. How do I block an individual member in a group? He/She is not in my contacts, only on the group chat.